A beautiful sewing box magazine rack sold for £15. 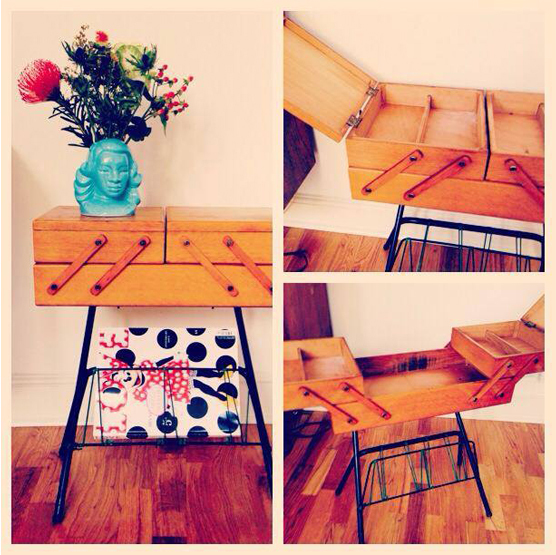 Thrift-ola is a considered collection of midcentury to modern, colourful ‘n fun objects and wares. I do however, from time to time, unearth a variety of other vintage treats that catch my eye yet don’t quite fit in with Thrift-ola’s ethos. This exciting bunch of goods will be bundled up into a series of flash sales hosted on Twitter. Last week I held a furniture sale which included this incredibly unique sewing box come magazine rack contraption I found at a flea market in France. Cute, huh? I do of course also partake in witty banter, links to jumble sales, vintage fairs and the like and I’m always on the hunt for recommendations which I’ll RT coz sharing is caring!